Obesity distorted John's reality. He lost 140 pounds in one year and developed an eating disorder to avoid going back. See how fitness helped him overcome adversity and find self-worth! I was huge and could no longer tie my shoes without contorting my leg. 290 pounds was the most I saw on the scale, but it could've been more. One day in April 2011, I was shoving a peanut butter and jelly sandwich into my mouth and my 8-year-old daughter told me I was fat. A new chapter in my life started at that moment. My wife told me to change my diet, join a gym, and get a trainer, which I did. I joined Anytime Fitness, which was fantastic for my endeavor because I could go to Anytime Fitness anytime, anywhere. I came to the gym each day, only compared myself to myself, and stayed consistent. Cardio was my primary focus for the first few months to form a habit. The cardio equipment was always in use except for the ugly stepchild rowing machine in the corner. I lived in that corner and loved the rowing machine. I finally signed up with a personal trainer who helped me start a weightlifting program and told me that 80 percent of the work was dieting. Amy (my trainer) did everything to point me in the right direction, but I blindly ignored her and my wife's diet/nutritional recommendations. I became bulimic in October 2011, six months after I stepped into the gym. I lost 100 pounds in six months and was down to 190 pounds with a combination of intense cardio, weightlifting, and a severe caloric deficiency. I lost so much weight on an improper, malnourished diet that I lost my sense of hunger and gained a distorted view of my physique. I was probably anorexic. 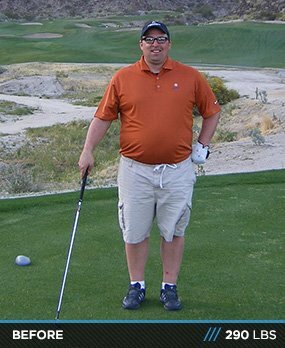 I will spare the yucky details, but by April 2012, after losing 140 pounds in 12 months, I was down to 150 pounds (maybe less) and still felt fat. I couldn't think straight and needed help. I went to the doctor and the emergency room shortly thereafter, which meant my wife came to the hospital. I told her and the nurse why I was there. That was hard for me because I didn't want to stop bingeing and purging—it made me feel in control. Admitting my disorder was the best step. I gained a support group through my wife and started therapy for eating disorders. I'm learning how to eat food. I struggle with relapses, but I made positive gains. I'm up to 176 pounds and I'm happy with it. My story isn't just about losing weight and getting in shape. It's about using proper guidance to get or stay in shape, and how to overcome an eating disorder. You must have short- and long-term goals. The only goal I set initially was to lose a tremendous amount of weight. It's helpful to track your progress. Had I eaten sensibly with a consistent combination of cardio and weight training, I would have lost the same amount of weight at a healthier rate. I employed several tricks to avoid food. When I walked into the kitchen and saw the kids eating pancakes, waffles, etc. out of my peripheral vision, I covered my face with a paper towel. The other "tricks" aren't worth mentioning because they only endorse improper eating habits. My inspiration came from knowing I would not live as an obese man and I could be a positive role model for my two girls. I had no hobbies before. I jumped into fitness with both feet. I lost weight in a manner that jeopardized my life. Starvation, fasting, and bulimia aren't the way to get from Point A to Point B. While my current nutrition plan may appear to be dieting, I'm trying to eat more real food. My goal is to gain lean muscle mass. I'm accomplishing this by eating small meals throughout the day. There's no grazing. When I eat food, I consider it an official meal, not a snack. At this point, I'm not focused on tracking my macros. I'm looking for balanced meals. I'm trying to overcome a serious mourning period after saying goodbye to food. To me, this is a lot of food, but I value every calorie. After doing a circuit routine and drifting from one machine to another, I discovered Layne Norton's PHAT routine on Bodybuilding.com. It was beneficial because it gave me focus on a daily routine. Now I use a different program recommended by Jack Friend of NW Muscle. I work each major muscle group twice per week without a rest day. I spend 15-20 minutes stretching and foam rolling. I work calves every day except for legs day. I recently added cardio into my routine once per week. I had to stop for a while because cardio was a primary tool for my caloric deficiency. My biggest challenge was finding time to work out. I work out early in the morning or late at night so I can dedicate myself to my work and family during the day. I'm fortunate that Anytime Fitness is close to my house and work so I can go at odd hours. I asked around if anyone knew men who suffered from eating disorders so I could pick their brain, but had no luck. 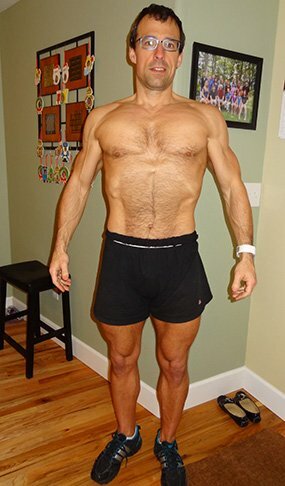 Bodybuilding.com was my best resource for information on it. At this point, I'm learning how to eat food all over again. Training is a release and an escape for me. I'm very lean and vascular right now, but need to add mass. My shoulders, back, calves, quads, and triceps are well on their way. My hamstrings are good, but I need to work on abs, glutes, and biceps for balance. If I ever compete, I want to bring the goods. I'm not there yet, but it could be in the cards down the road. For now, eating normal is my primary objective. Work efficiently and stay consistent. When you don't feel like working out or going to the gym, go anyway and do something (cardio, crunches, or stretching). These bad days lead to good productive days. I rate my days on a scale of 1-10. I give myself a 3 for just walking into the gym, cardio is a 4, cardio and weights is a 5, intense cardio/lifting is a 6. 6s are hard to attain. I receive a 7 for daily doubles and I never made it to an 8 (I left room for improvement). Show up and avoid creating excuses. When you get off work, automatically change into your workout clothes. I slept in mine so I was ready to go when I woke up. Concentrate on form and pace when performing a rep. Don't waist reps by failing to work the muscle properly. Check your ego at the door and don't jump into heavy weight. I still use light weight when I want to stress the contraction phase or practice joint articulation. There's no hurry. Take your time and try to feel each muscle working. Don't think about how others look. Think about how you're going to change and gain today. Reward yourself by trying a new exercise. You must eat a sensible, balanced diet. Don't make the same mistake I did by starving yourself to improve your self-worth. This isn't the answer. I value every calorie. Have a goal weight that your doctor agrees with. Bodybuilding.com has been extraordinarily helpful. The site has a number of articles on eating disorders which helped me understand what I was experiencing. Now my food comes from recipes, supplements, and nutritional information on the site. I discovered my initial lifting program, Layne Norton's PHAT, in the Articles section. I learned how to perform deadlifts and Pendlay rows from the Exercise section. I discovered bodybuilding competitions in the Forums and Jack and Kay Friend of NW Muscle from BodySpace. The transformation articles gave me hope and determination. BodySpace is a great way to track your progress. Thank you, Bodybuilding.com. My wife, Bernadette, has been wonderful from the start. She consistently worked out and tries to eat well. She did her best to help me and hasn't wavered. The folks at Sports Nutrition Center in Portland, Oregon, provided honest advice to build a meal plan. I also want to thank Eugene Para of Health Emporium in Fremont, California. 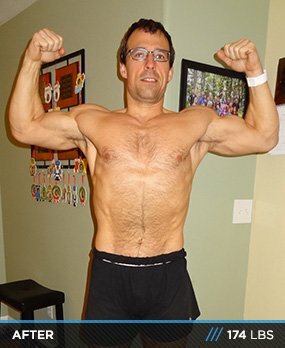 Gene helped me feel comfortable gaining weight and adding lean muscle mass. His knowledge and advice helped me adjust through my recovery. I also want to thank my trainer, Amy. She pushed me in the right direction. I followed her advice to use proper, strict form, and how to apply good time under tension to produce efficient lifting results. Last, Drexell Barnes and Phil Dube, from Southside Fitness in Eugene, Oregon, were always with me in my thoughts at the gym.